A depleted Harrogate Railway Athletic recorded their first victory in 10 games when they triumphed 2-1 over Armthorpe Welfare, on Tuesday evening. The win over their fellow strugglers was also Paul Beesley’s first as manager, and lifts the Locomotives out of the NCEL Premier Division relegation places. The first half of the game was a cagey affair, and the better chances fell to the visitors, with Paul Beesley forcing Will Biggs in the Armthorpe goal into a couple of great saves. The second half saw Railway gradually enjoying longer spells of possession, with Brandon Deane and Ryan Sharrocks becoming increasingly prominent down the flanks. Up front, Beesley and Stephen Bromley were creating a number of chances, with Biggs continuing to make some fine stops. In the 58th minute, it was a ball through the centre of defence that eventually undid Armthorpe. Bromley slipped around his marker and ran in on goal, with only Biggs to beat. Despite the gloveman’s attempts to get to the ball first, Bromley won the race and fired it home to give Railway a much-deserved lead. 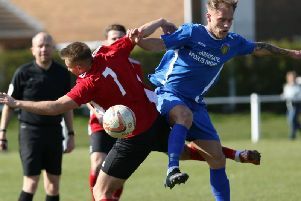 Welfare tried to respond, but Harrogate’s confidence was high and they pressed for a second goal which eventually arrived in the 77th minute. Armthorpe’s right-back, who had been given a torrid time by Deane, found himself under pressure from the pacy forward once again. Facing his own goal, the defender tried to pass the ball to his keeper, but under-hit it, allowing Deane to collect the ball on the edge of the box and run in on goal before slotting calmly past the advancing Briggs. Welfare pulled a goal back in the 82nd minute through Craig Aspinall, but despite four minutes of added time, Rail held on to claim all three points.